St. James Church is located on Long Island, in an area on the North Shore called the Three Village Area: the Villages of Old Field, Setauket, and Stony Brook. Included in the parish boundaries are the State University at Stony Brook, the University Hospital, the University Health Science Center, and the New York State Long Island Veterans Home. St. James Church now spans three centuries. It began in the late 1890s as a mission church when the Bishop of Brooklyn requested a Mission Order of Priests from Canada, the Montfort Fathers, to found a Catholic parish in the area. The Montfort Fathers started the Parish of Infant Jesus in Port Jefferson, a town situated where the North Shore Branch of the Long Island Rail Road terminated. At the same time, as requested by the Bishop, they began the mission church of St. James on Main Street in Setauket, the location of the mainline Protestant Churches. They also purchased land nearby for a cemetery. From the few dozen families that worshiped in the new mission Church as the century changed from the 19th to the 20th century, the Catholic population increased to hundreds of families as World War II ended. Bishop Thomas Molloy had the vision to change the status of the parish. 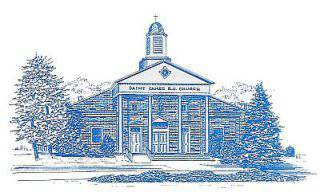 In 1949 the Mission Church of Saint James was changed to St. James R. C. Church. In 1823 the first Catholic Church in Brooklyn and Long Island was St. James Church in the City of Brooklyn, which was then part of the Diocese of New York. The Catholic Brooklyn Diocese was created by Pope Pius IX in 1853. In 1957, Pope Pius XII divided the Brooklyn diocese into two parts and established the Catholic Diocese of Rockville Centre to cover the Long Island, which included the counties of Nassau, and Suffolk, where almost three million people live, approximately half of whom are Catholics. During the last half of the 20th Century, the Three Village Area changed from a country rural area to one of the significant suburban growth areas of Long Island. In 1968, due to the population increases brought on by business and housing expansion, St. James R. C. Church moved into a new church adjoining their cemetery on Route 25A. In the year 2009, St. James Church marked its 60th Anniversary as a Church, and more than a Century since it was established as a Mission Church. In that period of one hundred plus years, the Catholic population of Saint James Church increased from a few dozen families in 1898, to about 3,500 families, with more than 10,000 people as the 21st Century began. Amen! –Original article by Hugh J. B. Cassidy and updated by Kevin McDonnell in 2009.